Green River builds and manages low-carbon diversified investment portfolios for clients. We do this primarily by using mutual funds and exchange traded funds offered by leading Sustainable Fund families. Funds are “baskets” of stocks or bonds, and are useful to investors for a number of reasons, including diversification, professional management and efficiency of trading. 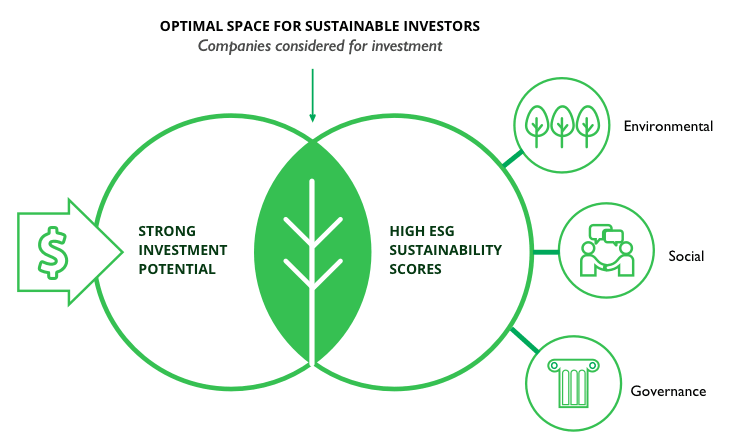 Sustainable, ESG investing is a rapidly evolving tool, or “lens,” through which professional investors and fund managers enhance their stock and bond selection process. It involves the full integration of environmental, social and governance (ESG) factors into investment analysis and portfolio construction. 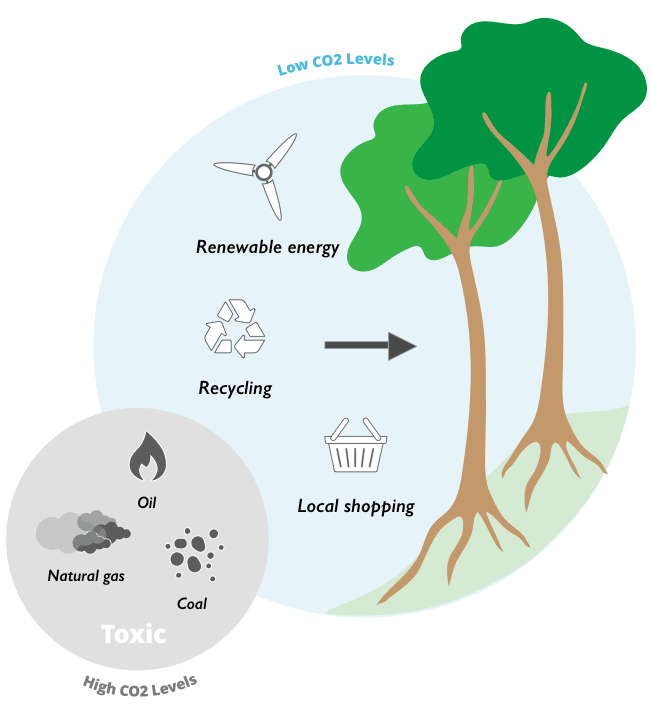 Researchers studying sustainable, ESG investing strategies are finding important correlations between a company’s stock performance and how that corporation impacts the environment (E), supports its employees (S) and governs itself (G). Green River uses data provided by AsYouSow and Morningstar to measure the carbon footprint reduction offered by sustainable funds, compared to funds that ignore sustainably concerns. Sustainable fund families offer investors an additional benefit: The ability to align themselves with other like-minded investors and advocate directly for improved corporate behavior, through the auspices of the fund families. Advocacy is orchestrated by filing shareholder resolutions and initiating other forms of direct dialogue with corporate executives and boards of directors. The NEW bi-annual US SIF 2018 Trends Report reveals that as of the beginning of 2016, $1 in every $5 under professional management in the U.S. was aligned with sustainable, responsible and impact investing strategies. This represents a dramatic increase since 2014, and there is no question that this percentage is higher in 2018. The total US-domiciled assets under management using Sustainable investing strategies grew from $6.57 trillion at the start of 2014 to $8.72 trillion at the start of 2016, an increase of 33%. Funds are groups, or baskets of many stocks or bonds. When an investor owns shares of a fund, she owns a fragment of each stock or bond held in that fund. Thus trading shares of one fund has the effect of adding or subtracting exposure to all the stocks or bonds held in the fund, with one transaction. Investing through funds is a very effective way to achieve diversification and control portfolio risk, as well as benefit from professional management’s expertise in deciding when to buy or sell stocks or bonds within the fund. At Green River, we take diversification several steps further. We compare similar Sustainable funds to each other in terms of performance, volatility and carbon footprint. We are truly “fund family agnostic” and continually review funds from a variety of fund families. We strive to include the best sustainable funds with the lowest carbon footprints in our clients’ portfolios. Honoring the Certified Financial Planning profession’s commitment to the Fiduciary Standard, our recommendations are always based on what is best for our clients. Some of the largest funds in the world are funds whose holdings mirror the S&P 500 Index. Many Financial Advisors routinely recommend these funds as core holdings for their clients. But according to FossilfreeFunds.org, 10% of every dollar invested in an S&P tracking fund goes to the fossil fuel industry (coal, oil and gas companies, and related industries). In addition, the S&P 500 Index contains three of the largest international tobacco companies. Perhaps the ultimate irony is that the screened fund is only 1% of the size of the S&P 500 tracking fund. Why wouldn’t Vanguard promote a higher performing fund, with a much smaller carbon footprint? None of us are mind readers, but it may have something to do with the enormous tax consequences investors would suffer if they sold shares of the S&P 500 tracking fund in a taxable account, to move into the screened fund. Additionally, Vanguard, together with the other huge legacy fund families Fidelity and American Funds, may be worried about public relations – some of their many institutional clients may be led by climate deniers. One problem is that many “do-it-yourself” investors and mainstream financial advisors do not look beneath the surface of the funds they own/recommend, nor do they take the time to find cleaner, “greener” funds that avoid companies doing significant damage to our environment. This is truly unfortunate, because there are numerous high performance funds available that avoid fossil fuel industry stocks. Institutional money managers are well aware of the value of Sustainable E-S-G analysis and Impact investing. The just released 2018 Report on US Sustainable, Responsible and Impact Investing Trends shows that by the end of 2018, the market size of sustainable, responsible, impact investing in the United States was $12 trillion dollars, a 38% increase since 2016, representing 1$ out of every 4 dollars professionally invested in United States. Nevertheless, even in 2019, many retail investment firms dealing with the general public seemingly have not gotten the memo, and continue to disparage sustainable investing – possibly because they are reluctant to leave the profitable financial embrace of the huge, legacy fund families to whom they have been sending their clients for many decades. More than 90% of the world’s leading climate scientists agree that to uphold the minimum standard of the Paris Accords (limiting the increase in average world climate temperatures (from the pre-1850 baseline) to 2 degrees Celsius, much of the world’s existing fossil fuel reserves must remain in the ground, unburned. As a Certified Financial Planner™, Patrick feels that it is his and Green River’s Fiduciary duty to help investors minimize the greenhouse gas (GHG) consequences of their investment choices, without compromising their investment goals. Even if supporting/investing in fossil fuel stocks could result in short term big profits (which certainly hasn’t been the case in 2017), what good would be served if ten or twenty or fifty years from now, the amount of carbon, methane and nitrous oxide in the air renders the earth nearly uninhabitable? In the past few years, numerous “low-carbon” and “fossil fuel free” investment options have been launched (according to Morningstar, 39 new funds in 2017 alone!) and many of these new funds are demonstrating excellent performance already. In 2019, it is now entirely possible to build a high performance, diversified global stock and bond portfolio, using low-carbon and fossil fuel-free Exchange Traded Funds (ETFs) and Mutual Funds. Visit FossilFreeFunds to see how much fossil fuel exposure a mutual fund has, and also to compare a fund’s carbon footprint to industry averages. Visit Morningstar to review their Sustainability scoring system, and see what scores they give to different funds. Gender equality is not a zero-sum game. Achieving gender equality is a good thing for everyone. Moreover, it’s good for business. A recent study by the BCG Henderson Institute suggests that increasing the diversity of leadership teams leads to more and better innovation and improved financial performance. A number of leading sustainable fund families are using the percentage of women in top executive positions and on corporate boards as an important E-S-G criterion when selecting stocks and bonds for the funds they manage. NEW FOR 2019: Investors now have an effective way to research the gender equality score of their mutual funds or exchange traded funds: WHAT IS THE GENDER EQUITY RATING OF MY FUND?